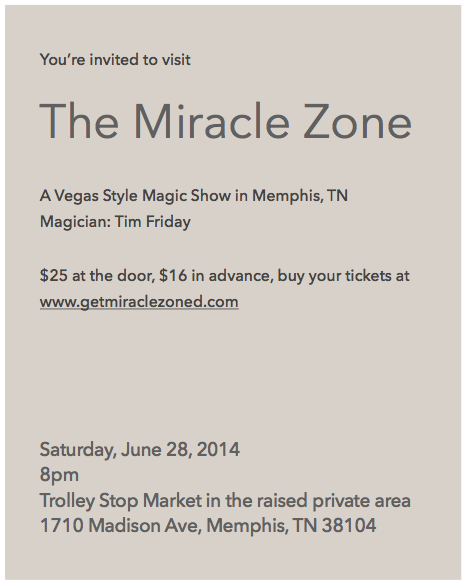 On June 28th you have a chance to see a stand-up magic show called The Miracle Zone. The performance on June 28th is open to anyone who buys a ticket, you can buy your ticket at www.getmiraclezoned.com. This show will have limited seating, if you want to go be sure to go ahead and buy your tickets now. Here are few thoughts about how I am putting the show together for you, specifically in regards to the marketing of the show. A marketer named Dean Jackson teaches simple but effective ideas for entrepreneurs. One of his basic principles is Before, During, and After. What do you do to reach potential customers Before they do business with you? What do you During the time when customers do business with you? What do you do After customers do business with you? It seems like common sense, but breaking it down like this helps you think through the whole process. How do you get people to buy tickets for a magic show? The website is set up so you can buy tickets and I have made a few posts on facebook. I was surprised to see that when you create a facebook ‘event’ the posts on the ‘event’ had zero reach to the people I invited. I will invite more people to the facebook ‘event’ but it seems like facebook is more interested in having you buy an ad to promote an event. For the show on June 28th I decided to create an invitation and send it to clients and friends. You’re gonna get Miracle Zoned! Maybe I’m old-fashioned but I believe a physical invitation is more likely to get a response. Even if it is a ‘no’ that is a response whereas on facebook it seems many events get lost in the clutter. Promo codes are included for you when I give or mail you a physical invitation so you get a few dollars off the ticket price. The show will sell out in advance online because there is limited seating and a few different large parties of people have asked questions about it this week. This is the show, the experience itself. One bonus for you is a talented guest performer who will be an opener for the show. Up to now when I do a show at a private event I make a list of tricks and I perform those tricks at the show. There is nothing wrong with this and it is very entertaining, but for a long time I’ve had an idea for a show with more depth and perspective. 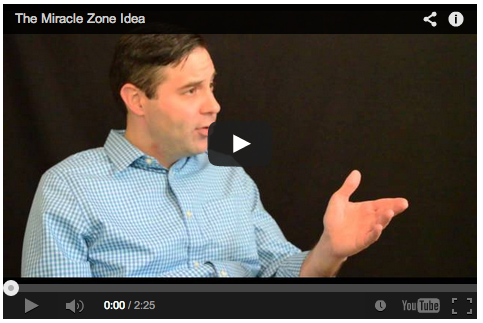 Here’s a video where I share with you the idea of The Miracle Zone. The Miracle Zone is a thread that runs through the whole show, but another thread is the topic of relationships. The Miracle Zone explores different relationship situations via magical presentations. Magic tricks by themselves are very entertaining, but magic tricks combined with a unique perspective have the potential to connect with an audience on a deep level. Worst Case: it is remarkable, that doesn’t necessarily mean you love it, it could mean you hate it, to be remarkable means good or bad it is worth making a remark about, in others words it is not ‘blah’, ‘vanilla’, you watch then forget. Another bonus planned for you is a professional photographer will be at The Miracle Zone. He will be taking photos of you during the show and at the end of the show you will have a chance to get a photo with me before you leave. I will email you all the photos and you get the option if you would like me to stay in touch with you through email or if you would simply like for me to send you an email after the show with different easy ways to access your photos. In conclusion putting together this show for you is an exciting learning experience. This will be the first show where you are able to buy a ticket instead of having to throw a private event, and it is a thrill to put a new idea into action, from the creative side and the marketing side. I hope to see YOU there on June 28th!